Last weekend Ben and I had an evening at the coast. We hadn't been fishing together for a couple of weeks so it was pot luck where to go. 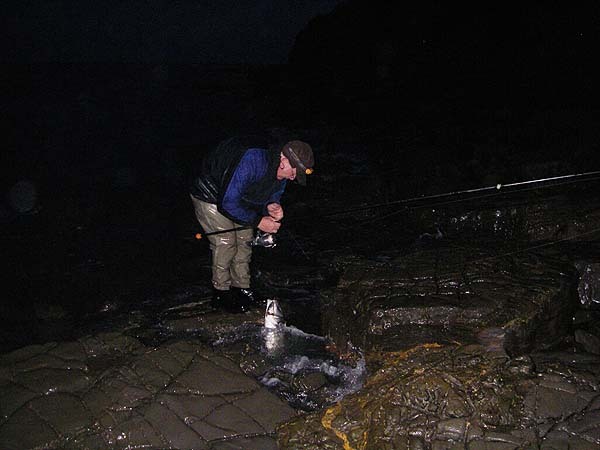 It was almost high water so we opted for bait fishing over the ledges first of all - I tried a freelined mackerel head and Ben used a fillet - both were futile and we never had a sniff so, after about an hour we gave it best and shifted to another spot for a bit of plugging. It was still pretty light when we started spinning so we were not surprised when nothing happened for a while then I had a knock - certainly a fish! 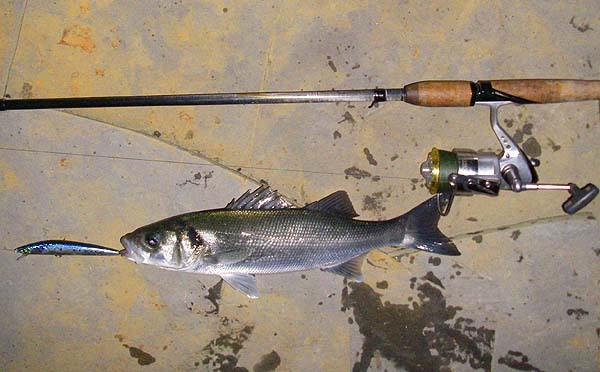 Shortly afterwards I had a small bass. This was followed by another one then another bite or two and then a third bass. Reasonable results for a short session. 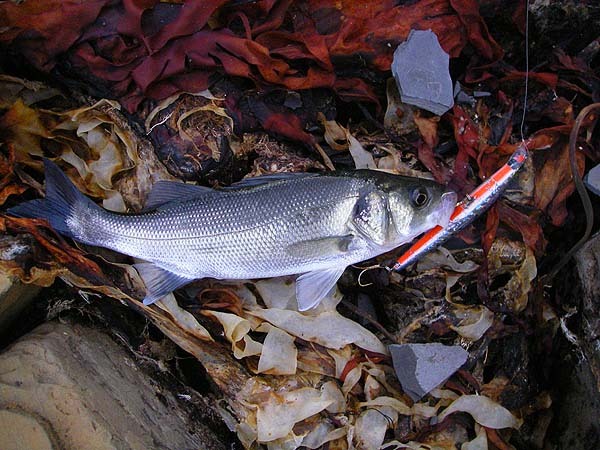 For some reason Ben, using the same lure, was fishless as were three other anglers a bit further along the shore. We packed in and left them to it. I was quite buoyed up by catching a bass or two (albeit on the small side) and decided to go the next morning - Ben opted out of the early start. When I got home I rang Nigel and we arranged to meet at four-thirty the following morning. 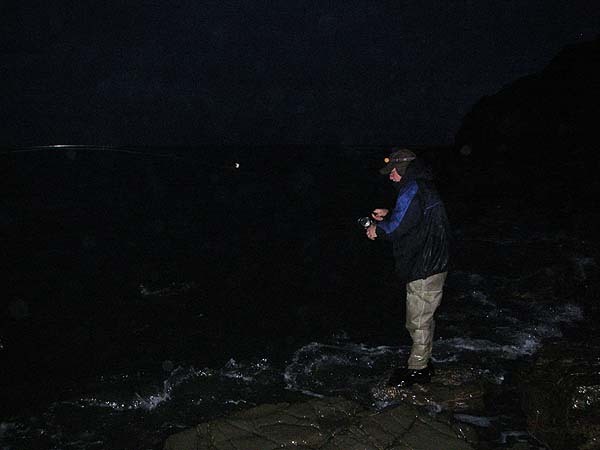 It was still pretty dark when we began to fish - me with last night's plug and Nigel with a freelined mackerel head. While it was still pretty dark I had a bite then I landed a bass - a bit better than the ones I had the night before. Nigel, wisely, ignored my success and stuck to his freelining. 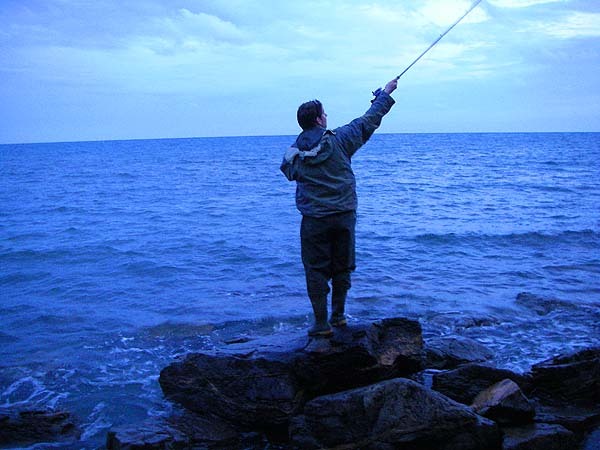 It was probably ten minutes before my pal, only twenty metres to my right, called out that he had a fish on. I put down the rod and grabbed the camera. I had to get quite close before the flash picked him out in the gloom but I could see that it was a decent bass. 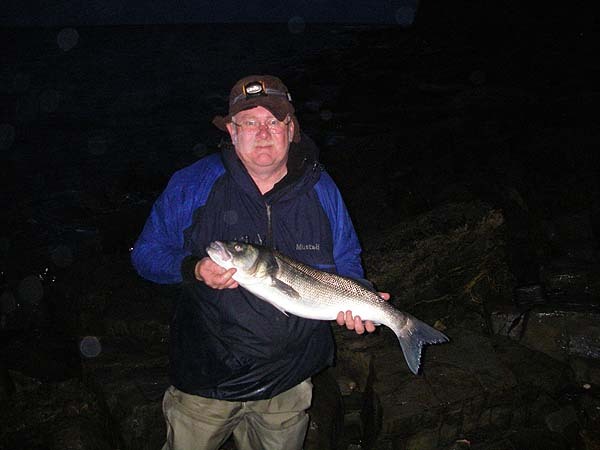 Eventually he slid the fish ashore - just under nine pounds - a cracker. After a picture he returned it to the sea. We moved to another spot a mile or so further on and tried bait fishing there but - nothing! As it got light we fished over the ledges with lures (where we were joined by our friend Richard Gardiner) and I had a modest bass and lost another on a Yo Zuri surface popper while Nigel landed a small ballan wrasse on his plug. 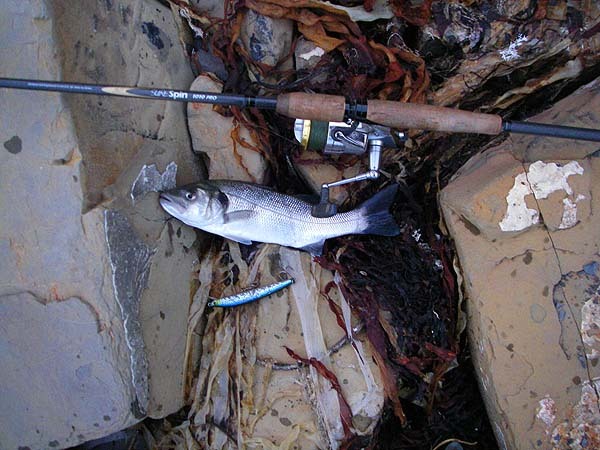 Richard had a small bass and dropped a garfish and a pollack. All in all a pretty good morning's fishing.